Earlier this week in advance of the release of the Diamond Comic Distributors preliminary sales report for October 2017, I tweeted that the same month last year would be very hard to beat, even with Marvel's Legacy event and DC's Dark Multiverse storyline underway. The second best month of 2016 in the Direct Market, October 2016 had a huge number of new releases: 536 new comics, the most all year, many of which were double-shipped Rebirth issues. And it was further assisted on the unit sales side by several hundred thousand copies of Big Trouble in Little China/Escape from New York #1 which went to Loot Crate; it was the largest number of copies Diamond shipped of any comic book all year. 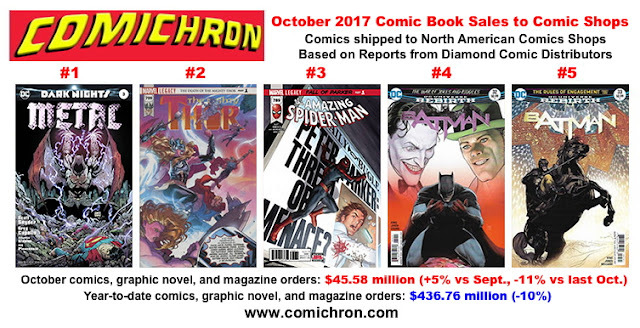 But while beating last October seemed unlikely, I noted that trajectory mattered — and while Diamond today reported that orders for comics, graphic novels, and magazines were down 11% versus last October, they were up 5% over September 2017, a month which also had four shipping weeks. The month's top seller was Dark Nights: Metal #3, with six other Batman releases making the Top 10; three Marvel Legacy issues rounded out the top 10, including the second-place Thor #700. Comichron calculates that retailers ordered $45.58 million in print material at full retail, $2 million more than September and almost tying the total from this August, which had an extra shipping week. While both were down versus last October, Marvel and DC sold retailers more dollars worth of merchandise this October than they did in September — and Image continued to outpace the market, beating its year-ago total by 8% and climbing to an 11.46% market share. Speaking of Image, a positive sign was to be found in Diamond's graphic novel sales to comics shops, which managed to beat their pace from the same month a year ago by more than 2%. That's the first graphic novel year-over-year win since May, the only other month this year in which that happened. Image had six of the top ten graphic novels, including the top-selling Walking Dead: Here's Negan hardcover. The number of new graphic novels that shipped this October is the same as last October: 345. Meanwhile, many fewer new comics were released this October: 484, down 8% or 52 comics from last October. Perhaps owing to Legacy, Marvel's release slate was its smallest in a long time; Marvel released 81 new comic books, its fewest since February 2016 and eight fewer than it released last October. The 7.62 million comic books retailers ordered, while nearly identical to orders from the previous two months, was off 21% from 2016's overstuffed October; that shortfall likely drops to 18% with the Loot Crate book removed. While October starts the fourth quarter out behind the same period last year, last October was the market's last peak month, in a sense; eleven out of the next twelve months would see declines. The comparatives get easier from here; there's a good chance that the overall year could end up only off in the single digits. That's not great news, but it would represent a boost over the worst point of the year, and would keep the Direct market ahead of the recession-year 10% drop seen in 2009. As I noted in the Off Panel podcast which released earlier this week, perspective means a great deal to interpreting the market's position; while Star Wars' return to Marvel and Rebirth posed tough comparatives for 2016 and 2017 respectively, it's worth remembering that through October, the Direct Market is up 29.2%, or nearly $100 million, over its position at the same point of 2011, the year the New 52 helped re-energize sales. Dollar volumes this September and October, in fact, roundly beat those from the first two New 52 months — and while inflation plays a role, it does not account for all of the increases. Comichron founder John Jackson Miller has tracked the comics industry for more than 20 years, including a decade editing the industry's retail trade magazine; he is the author of several guides to comics, as well as more than a hundred comic books for various franchises. He is the author of novels including Star Wars: Kenobi, Overdraft: The Orion Offensive, Star Wars: A New Dawn, and the Star Trek: Prey trilogy. His new Last Jedi prequel hardcover, Star Wars: Canto Bight, releases December 5. Read more at his fiction site.